Are There Different Types of Woodworm? How long is the Woodworm Lifecycle? How Do I Find Out If I Have a Woodworm Problem? Should Woodworm Always Be Treated? Do I Have to Move Out During the Woodworm Treatment? Is Woodworm Treatment Safe for Pets? How can you control woodworm infestation? What is a Typical Cost for Woodworm Treatment? Woodworm is the most common name for the larvae stage of wood boring beetles. This type of beetle is usually found in households from early springtime to mid-autumn. From April to October each year, these seasonal pests can target any home that has exposed untreated timber in the interior or exterior of the home. Chances are, your home will be affected by woodworm at some point, as these pests are so small you may not notice their arrival. From fixtures to floor boards, the average home is made up of 70% timber. This is why woodworm is such a common problem for homeowners. 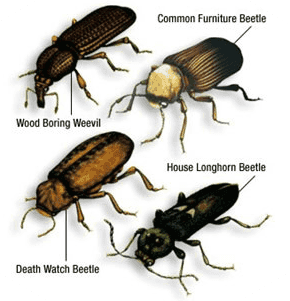 The most common wood destroying beetle is Anobium punctatum known as the “common furniture beetle”. 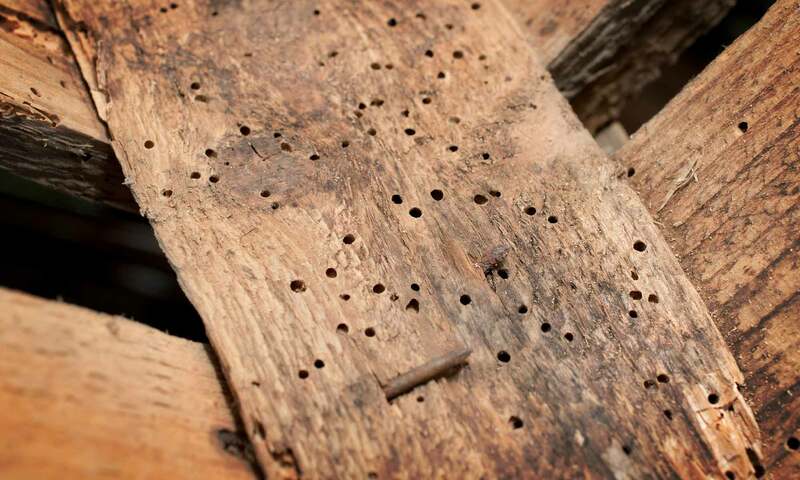 Many homeowners only notice woodworm once the infestation has spread, or they start to see the flight holes of the adult beetle. Active woodworm could be missed as the infestation could be hidden in remote areas of your property or under floor coverings. Common Furniture Beetle: Most common of all woodworm species responsible for around 75% of all attacks in property. House Longhorn Beetle: Normally found in roofing timbers, this beetle is the largest and most damaging. Wood Boring Weevil: Affects timber that has been attacked by fungal decay. Death Watch Beetle: This type of beetle prefers hardwood and causes damage to older buildings. The most common wood destroying beetle is Anobium Punctatum also known as the common furniture beetle. Anobium Punctatum is a woodboring beetle, which means in its larval stage, it bores through the wood. Think you have spotted woodworm in your home? Adult Anobium Punctatum measure around 2 to 4 millimetres in length and have brown, ellipsoidal bodies. Egg – A tiny egg is laid in the cracks and crevices of wooden objects, floorboards and other timber by Adult beetles. These eggs are easily missed by the human eye, the main reason why woodworm infestation spreads so quickly. Larva – The second stage of their development occurs when the larvae hatch. At this stage, they immediately burrow through the wood, again, making it very hard for them to be seen by home owners. During this stage, the larva can remain hidden inside the wood, tunnelling, and feeding for several years. Pupa – The more the larvae consume, the bigger they will grow. As the larva increase in size, they then become known as Pupa and are ready to exit the timber. Adult beetle – In the final stage of development the adult beetles emerge from the timber and create the flight holes you see on the timber surface. Once a woodworm has developed into adult form, it does not feed and instead, it reproduces. When the beetle begins to mate, the female will start to lay her eggs into cracks or old exit holes which have been created in the wood. The eggs which are produced will hatch after three weeks. The Larva then enter the wood and the cycle continues. Did you know that woodworm larvae spend roughly 3 to 4 years under the surface of the timber, eating their way through untreated timber? During this time the pests will slowly increasing in size. 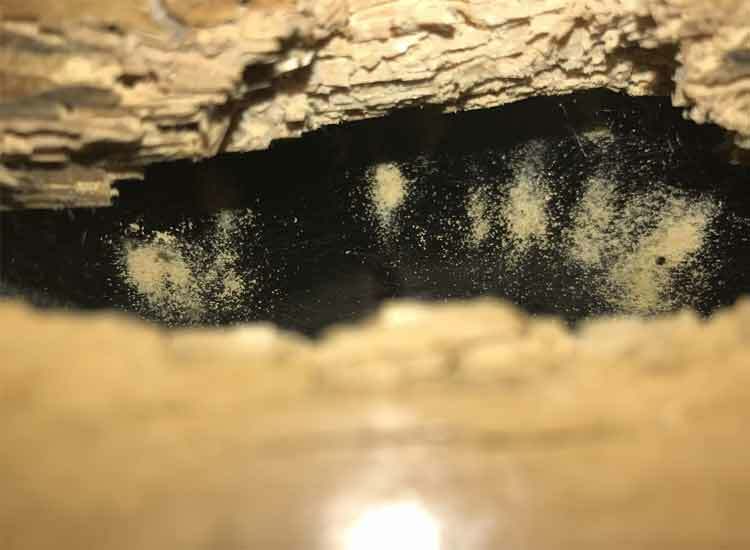 From there the larvae will evolve into a beetle form, continuing to bite through the surface of your home’s timber, until parts of the property are destroyed. If untreated, woodworm can cause serious damage to the structure of your home. These pests will continue to feed on the timber until it emerges, leaving a network of tunnels behind them. Of course, this can cause severe damage if the problem isn’t treated immediately. There are signs which could indicate that your home has a woodworm problem. If the problem has escalated without your knowledge, then the adult beetles could be seen exiting the timber. Once the adult beetles have exited, they will leave small, round/oval holes on the timber surface. Also you will generally see piles of bore dust near the flight hole. The longer you leave your woodworm infestation, the worse it will become. Woodworm should be treated as soon as possible and if it is left, it could cause major damage to the structure of your home. Woodworm can be tricky little pests and you need to make sure that you have targeted them all. For this reason, we always start with a property survey to make sure we know the extent of the problem and determine if the infestation is active. If the infestation is inactive the infestation does not need to be treated however structurally affected timbers may need to be repaired. Once the survey is complete and the infestation is found to be active, it is time to get rid of the woodworm living in your home and start to repair the damage which they’ve caused. 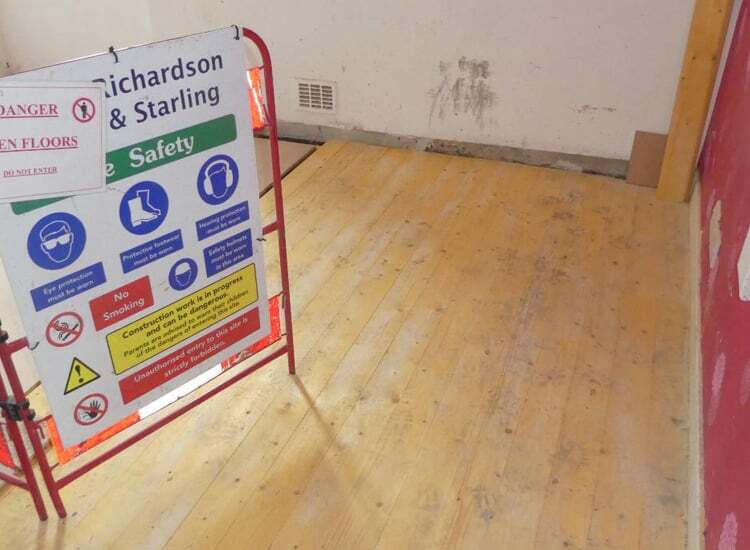 Richardson & Starling will take care of both aspects of this, repairing the damaged wood and treating the existing timbers to eliminate the insect attack. Remember, our work is protected by a 30 year guarantee, so there’s no need to worry about future infestation to the treated area. If you want to remove a woodworm infestation from your home, you should contact a professional property preservation specialist that can complete a competent property survey and use the correct chemical insecticides, safely. Our technicians have been trained and qualified to use chemicals properly in your home to protect you and your home during the process of timber treatment. Our team can both repair the structurally affected timbers as well as clean and treat the surface of the timbers. We will apply a water based insecticidal fluid to the surface of the wood. This fluid is effective as it will target the larvae entering the wood as well as emerging beetles. An average woodworm treatment can be completed in 1 day and our 30-year guarantee is given to ensure no re infestation will occur to the treated timber. Our chemical process is guaranteed to eliminate the infestation from the affected area. We are often asked by our customers if they need to move out of their home while woodworm treatment is taking place. In most cases, our clients do not need to move out of their property during woodworm treatment. We do recommend, however, that no one is allowed in the area which is being treated for an 8-hour period. We work with our clients to make sure that their treatment is done during a time which suits them. The treatment area will be well signed regarding no access during the works and for 8 hours after the treatment is completed. If extensive areas within the property are being treated, their treatment can be phased to suit the client. If the infestation in your home has spread and you would like to have your whole home treated at the one time, we would suggest that you decant the property for the day. We understand that many home owners worry about having treatment completed in their home if they have family pets. We recommend to all our customers that there are no animals or fish allowed in the treatment area during the treatment and for 8 hours after the treatment is completed. We have years of experience eradicating woodworm infestations in homes across Scotland and the North of England. We offer a 30-year guarantee on the woodworm completed treatments, giving our clients peace of mind that the treated area will be free of insect attack in that period. Infestation can be tackled by the application of a residual insecticide (known as permethrin) to infected areas. This is a chemical product and should be applied only by professional treatment contractors. If you are trying to tackle the infestation alone, simple aerosol insecticide sprays will not be effective over all the timber surface. Treatment is only required for active infestations, however, structural damage to the timber could still be present even if the infestation is inactive. Before going ahead with a survey of your home, it is difficult to give a typical cost for Woodworm Treatment. Each woodworm infestation is different as homes come in all shapes and sizes. The extent of damage will vary from home to home, therefore prices for repairs and materials will differ. After our surveyor inspects your property, he will give you a report of his findings with a specification and quotation to solve the woodworm problem.